Some more good news coming out of ITEXPO. Junction Networks has confirmed that the popular Aastra phones work with their hosted PBX service called OnSIP. Junction Networks' New York lab tested the Aastra 53i, 57i and the 57iCT model business phones for interoperability with the full range of OnSIP features and applications, including call waiting, call forwarding, auto attendant, caller ID, voice mail, do-not-disturb settings, and more. Is it me or does it seem like Aastra phones are everywhere? They're supported on SIP-based IP-PBX, Microsoft Response Point, Asterisk-based solutions, and more. Aastra is certainly on the ball when it comes to adding support to various phone systems - perhaps more so than other phone manufacturers. Junction Networks, host provider of the award-winning OnSIP Hosted PBX service, has confirmed that Aastra's SIP-based IP phones are perfectly suited for use as extensions to OnSIP. 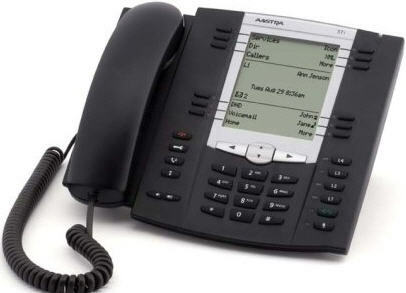 Junction Networks' New York lab tested the Aastra 53i, 57i and the 57iCT model business phones for interoperability with the full range of OnSIP features and applications, including call waiting, call forwarding, auto attendant, caller ID, voice mail, do-not-disturb settings, and more. The 53i features a three-line display and six programmable buttons, and the 57i and 57iCT feature a large, self-labeling display with 12 programmable keys, giving access to 30 programmable functions on multiple scrolling pages. Both phones can handle up to nine simultaneous line appearances. Each Aastra IP phone displays a mini browser that provides access to powerful XML applications and services. The XML API from Aastra allows the phones to run customized applications, such as call accounting to keep track of billable phone time for multiple clients. The phones' programmable keys can also be used to execute OnSIP-supported functions in any way users desire. In addition, the Aastra 57i CT cordless telephone (CT) allows a user to roam within a 300-foot radius of the 57i telephone. The CT handset works seamlessly with the telephone, duplicating features and functionality for the mobile worker. "We want to give OnSIP customers the greatest possible choice of hardware and software to use as OnSIP extensions," said Junction Networks President Rob Wolpov, "and we know from our testing that Aastra has earned its reputation for reliability, voice quality and ease of setup. Aastra's popularity in the SIP space also means that more new OnSIP customers will be ready to use our service the minute their decision is made, without any equipment cost." "Junction Networks provides an innovative, SIP-based VoIP solution to the market place and we are happy to be part of their hardware solution set. Aastra IP phones are very intelligent end points and we are confident that our new relationship with Junction Networks will take full advantage of that intelligence, in ways including use of the Aastra XML application developer tool kit," said John Drolet, vice president of U.S. sales for Aastra Telecom. Windows Live Messenger Back in the VoIP game!